Emergency service personnel at the scene in Blacksod. THE ROAD TO Blacksod pier is beautiful, snaking along the Atlantic coast before arriving at the lighthouse which sent the weather forecast for D-Day. Indeed, under normal circumstances the drive could make an ad for the Wild Atlantic Way. But these are not usual times. Stillness was interrupted early this morning when Rescue 116 disappeared from radar. Treasured normality was put on hold for this small coastal community when Coast Guard pilot Dara Fitzpatrick was pronounced dead yesterday afternoon, her three colleagues still missing overnight. And, yet, for some the search was the every day. Like the Coast Guard worker who tells you the volunteers who have been searching since 7am will still go to their jobs later in the day. For an organisation that does so much and asks so little, today was just another day of saving lives and bringing loved ones home from sea. Never mind that that until last November the Coast Guard, which hadn’t lost a member on active duty, was now dealing with four likely deaths. This was a day to react in the only way they knew how. That reaction was evident too in the ordinary people of Blacksod. The helipad beside the lighthouse is used by rescue helicopters every week. And the locals know well when it’s in use. The red lights can be seen from across the bay. Last night was supposed to be no different. Rescue 116 was due to land at Blacksod, be refuelled by attendant Vincent Sweeney and return to Dublin. Six miles from the shore, however, something went wrong and it went missing. 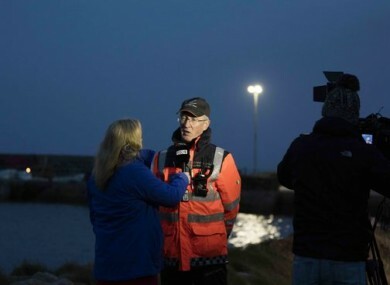 Its disappearance has brought home the value of the Coast Guard’s work says local councillor Gerry Coyle, who himself arrived on scene with food and drink for volunteers and searchers. “It’s so sad because the Coast Guard was involved in two big searches here last year. “We take them for granted… When we were going to bed last night, these fellas here were rushing off to rescue somebody. “And that’s what makes it extra sad – that the mission had been successful. Local fisherman Henry Kane knows that the community has pitched in first hand – when news broke, his son Sean went to the crash site in his own boat, eventually finding debris and returning it to investigators. “As it happens, I was up early this morning and saw the helicopter going to the rescue mission but didn’t know that’s what it was. Indeed, a national community of sorts came together on the water as well, with the RNLI, Aer Corps, Naval Service and local boats joining the search. None of the locals can recall a tragedy such as this. Noel Cawley says that the Coast Guard “come and go” regularly but that residents “take no notice”. Kane says the people of the area are “very, very down” but that didn’t stop men and women arriving with trays of sandwiches – or the local pub serving soup when it usually only does food in the summer. This community, which plays such a key role in the day-to-day safety of people in the west and northwest, was the centre of a tragedy – and it wasn’t found wanting. But for all the spirit, there was a real sense of tragedy. Horror that a loved, admired and inspirational woman had lost her life. Further heartache that she had died doing what she had spent 20 years doing – saving lives. And then the uncertainty for her crew mates. Locals here recall a search for a fisherman that went on for a fortnight. When Gerard O’Flynn confirmed that his colleague Dara Fitzpatrick had died, the worst fears of all were confirmed. O’Flynn would later say that hopes for the other three grow slimmer as the time ticks on. “With the passage of time, the level of hope goes down, but you never know. A pared-back search continues overnight. Full service resumes at full light. Email “'You hang on to a thread of hope but are fearful' - The search for Rescue 116”. Feedback on “'You hang on to a thread of hope but are fearful' - The search for Rescue 116”.